The title is a little deceiving, a little surprising if you are an Ottolenghi die hard fan. Simple is not something we would generally think of when we summon up images of his recipes â€¦ not necessarily due to the complexity of the techniques but more about the sheer number of ingredients â€¦ but in fairness in this case simple does not mean bland â€¦ in fact it means anything but! All the recipes (12+) that i have cooked so far are still very much â€œOttolenghiâ€� and ridiculously tasty! For the second effort I changed two things one â€¦ I marinated the chicken the night before and two â€¦ I used the correct ingredients! Place the chicken in a large, non-reactive bowl and add all the remaining ingredients, apart from the wine and date molasses, along with 1 teaspoon of salt and a good grind of black pepper. Gently mix everything together, cover the bowl and leave in the fridge to marinate for 1-2 days, stirring the ingredients a few times during the process. Preheat the oven to 180C fan (200C traditional). 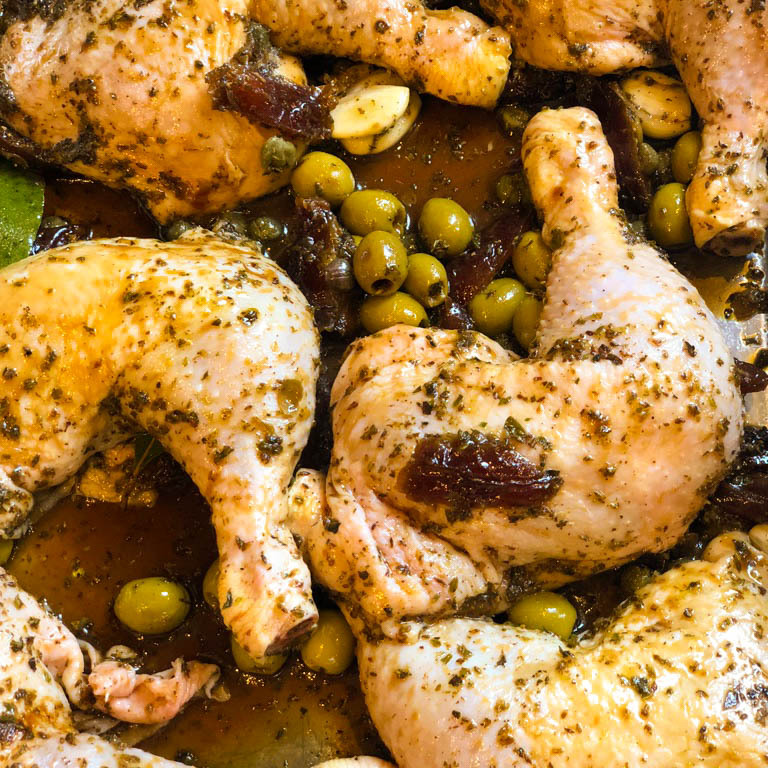 Spread the chicken legs out on a high-sided medium baking tray, along with all the marinade ingredients. Whisk together the wine and molasses and pour over the meat. Place in the oven and cook for 50 minutes, basting two or three times, until the meat is golden-brown on top and cooked through.